Objectives : To evaluate and compare the clinical performance of Giomer (Beautifil II) and RMGIC (Fuji II LC) in noncarious cervical lesions. Materials and Methods : Thirty-two subjects with one or two pairs of noncarious cervical lesions were included in the study. Each pair of lesion was restored with either giomer or RMGIC assigned randomly. Clinical evaluation of restorations was done using USPHS criteria. Data was formulated in a predesigned format and subjected to statistical analysis using the chi square test. Results : Statistically significant difference was found between RMGIC and Giomer with respect to surface roughness with P value <0.001. Conclusion : Giomer showed superior surface finish compared to RMGIC. Both Giomer and RMGIC showed equal retention ability. New materials are being introduced to address the need for restoring cervical lesions. Giomer is one such category based on prereacted filler technology (PRG) where prereacted glass particles are incorporated in the resin matrix. PRG fillers are fabricated by acid-base reactions between fluoride containing glass and poly acrylic acid in the presence of water to form wet siliceous hydrogel. PRG technology is divided into full reaction type (FPRG) and surface reaction type (SPRG). With FPRG the entire glass filler is reacted with poly acids while in SPRG only the surface of the glass filler is reacted and the glass core remains. , Beautifil (Shofu, Kyoto.Japan) is a tooth colored restorative material that uses resin base and SPRG filler technology. Beautifil II is a second-generation giomer introduced into market claiming better optical properties. Literature search reveals a few studies conducted on giomer in class V NCCL and in class I, II lesions over a period of 1 to 8 years with good clinical performance. ,,, The available literature does not show any studies comparing giomer with RMGIC. Hence, the purpose of this study was to evaluate and compare the clinical performance of Giomer (Beautifil II) and RMGIC (Fuji II LC) in NCCL. The research hypothesis was that there is difference in the clinical performance of giomer and RMGIC in NCCL. The null hypothesis was that there is no difference in the clinical performance of giomer and RMGIC in NCCL. 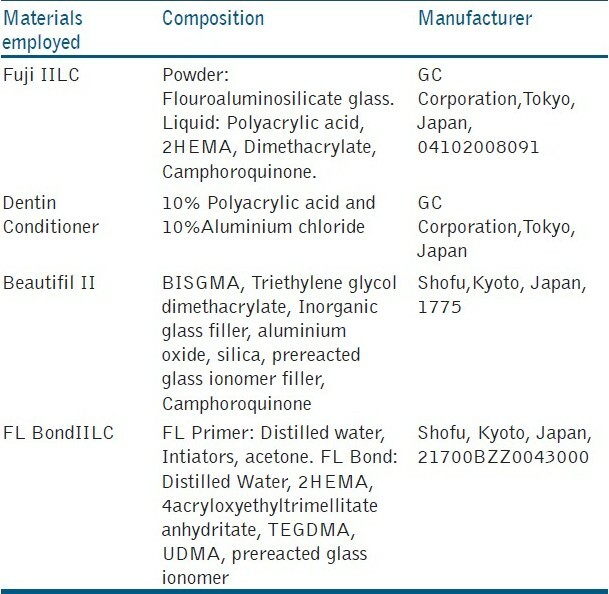 The materials used in the study are shown in [Table 1]. The study was conducted in the department of conservative dentistry and Endodontics, Sri Siddhartha Dental College and Hospital, Tumkur, after obtaining Institutional Ethical clearance. Thirty-two subjects with one or two pairs of NCCL with the depth ranging from 1-3 mm were included in the study and a written informed consent was obtained. Thus, a total of 80 restorations were performed. The sample size estimation was done using n-master software (developed by the Department of Epidemiology, CMC, Vellore). The following values were incorporated into the software- α (allowable type I error) 0.05 (5%), β (allowable type II error) 0.20(20%), and power of the study (1- β) = 80%. The minimum difference clinically significant was assumed to be 0.30 (30%). The statistical test employed was one sided. The minimum sample size required was 25 in each group. Anticipating the loss to follow up we selected 40 in each group. The lesions were classified as being saucer shaped or V shaped. The presence of sensitivity was recorded by taking the history and clinical examination. The selected pair of lesions in each subject was randomly assigned for either RMGIC or Giomer. All the subjects underwent oral prophylaxis within two weeks before the placement of restorations. The lesions were not prepared with rotary instruments following the guidelines of American Dental Association Acceptance program for dentin and enamel adhesive materials that do not allow placement of bevels. The lesions were cleaned with prophylaxis paste and rubber cup to remove the topped deposits at the time of restoration. Shade selection was done using a Vitapan classic shade guide. (Zanfabrik H.Ranter Gmbh & Co, KG Germany) Isolation of the area was achieved using cotton rolls and saliva ejector. Gingival retraction cord was used in case of subgingival lesions. Manufacturer's instructions were used for the placement of restorations. After 24 h, all the restorations were finished under water cooling with fine and super fine diamond points (Diaburs, Mani). Polishing was done with soflex discs (3M ESPE). Subjects were instructed to use soft brush with a toothpaste. The subjects were called at the end of 15 days, 6 months, and 1 year for evaluation of restorations by a single calibrated investigator using mirror and explorer under good operating light using USPHS criteria [Table 2]. The investigator was blinded about the restorative materials used in the study. The data was entered into spread sheets and statistically analyzed using the chi square test by applying SPSS version v 10.5. All the 32 subjects were available for recall at 15 days, 6 months, and 1 year and all the 80 restorations could be evaluated. Of the 32 subjects, 22 were males and 10 were females with the age ranging from 20-60 years. Out of 80 restorations, 54 were in maxillary teeth and 26 were in mandibular teeth. Seventy-four lesions were V shaped and six were saucer shaped. Forty-six lesions presented preoperative sensitivity. 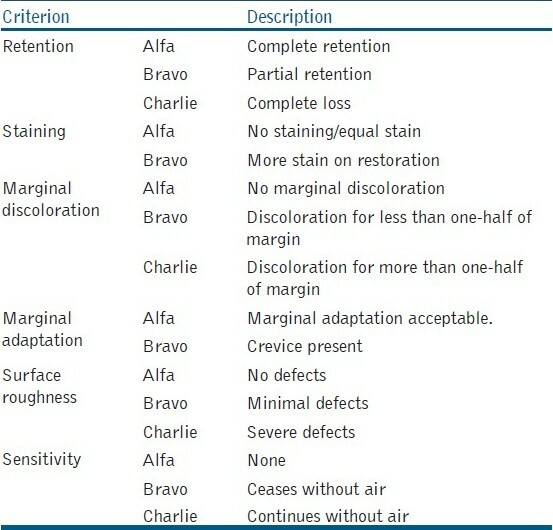 [Table 3],[Table 4],[Table 5] shows the comparative data for retention, surface roughness, and marginal adaptability between Giomer and RMGIC at different evaluation periods. None of the restorations presented marginal discolouration, staining, and postoperative sensitivity. At the end of 1 year for retention, 34 (90%) restorations were assigned the Alfa score and 4 (10%) restorations were assigned the Bravo score for both Giomer and RMGIC exhibiting the equal retention ability. There was statistically significant difference between Giomer and RMGIC for surface roughness at 15 days, 6 months, and 1 year interval with P value of 0.001, <0.001, and <0.001, respectively. At 1 year recall for marginal adaptability 35 (87.5%) Giomer restorations got the Alfa score and 5 (12.5%) got the Bravo score. Whereas RMGIC 31 (77.5%) got the Alfa score and 9 (22.5%) the Bravo score without statistically significant difference. None of the restorations either Giomer or RMGIC were completely lost. However, the decreased Alfa rating (87.5%) for both the materials at the end of 1 year is quite disappointing compared to other studies. ,,,, The partial loss of restorations (12.5%) was along the cervical 1/3 area. This may be due to the restorative materials being exposed to tensile stresses because of cyclic flexural deformation of the cervical region during occlusal loading of the teeth as explained by Tyas , ) and Grippo. RMGIC has a significantly lower flexural strength compared to resin composites  and are brittle which may lead to fatigue cracks resulting in a loss of a bulk of material or chipping of the restoration along the cervical margin. The partial loss of Giomer restorations along the cervical margin presently remains obscure. Long-term observation may be helpful in better understanding. Giomer restorations exhibited the superior surface finish compared to RMGIC at all time periods with P value <0.001. This can be explained by the microstructure and a mean particle size of the restorative materials. The mean particle size of RMGIC (Fuji II LC) is shown to be 4.5 to 4.8 micrometers , where as for Giomer it is 20 to 40 nanometers. Apart from this, powder has to be mixed with liquid component in Fuji II LC risking the induction of air bubbles. This porosity will contribute to the clinically detectable higher surface roughness. Various in- vivo, and in-vitro studies have also shown superior surface finish with Giomer, where as RMGIC is shown to be inferior to resin composites. , This study is also showing similar observations. None of the restorations exhibited staining, marginal discolouration or postoperative sensitivity in this study. The superior performance of Giomer regarding staining is due to nano fillers used in the composition that impart the smooth polished surface. Although RMGIC were slightly inferior with more Bravo ratings for surface roughness, surface staining could not be seen. This may be due to a short study period and the evaluation by naked eye having limitation in perceiving subtle changes. The absence of marginal discolouration with both Giomer and RMGIC is an indication of good bonding of these materials with the tooth structure without microleakage. This observation is similar to the observations by Sunico  and Matis. Although 46 (57.5%) were found to have preoperative sensitivity none of them exhibited postoperative sensitivity indicating good bonding with the tooth structure. The self-etching primer and the bonding system (Flurobond II) used in this study must have helped in establishing good marginal integrity. Self-etching primers dissolve the smear layer incorporating it into the mixture of collagen fibers and resin monomers, that is, integration of smear layer with the hybrid layer  by simultaneous conditioning and priming. This simplified bonding technique results in reduced postoperative sensitivity. Moreover, Flurobond II contains 4 - AET which has been shown to interact with calcium cat ions derived from hydroxyappatite to form relatively insoluble calcium salts resulting in improved durability of the self-etching adhesive. RMGIC are basically glass ionomer cements with the addition of small quantity of resin (4.5 to 6%) such as HEMA or BISGMA in the liquid component early set on exposure to light. The true chemical bonding of RMGIC with the tooth structure is responsible for the absence of postoperative sensitivity. Direct comparison of this study with other studies was not possible as this is the first study to compare Giomer with RMGIC. However, comparison of the results was possible with studies where any one of the present study materials is used with the same clinical protocol and evaluation criteria. Long-term observations are necessary to better understand the materials. 1. Heymann HO, Sturdevant JR, Bayne S, Wilder AD, Sluder TB, Brunson WD. Examining tooth flexure effect on cervical restorations: A 2 year clinical study. J Am Dent Assoc 1991;122:41-7. 2. Non carious cervical lesions. Recommendations for clinical practiceOper Dent 2003;28:109-13. 3. Bracket WW, Browing WD, Ross A, Bracket MG. Two year clinical performance of a poly acid modified resin composite and RMGIC restorative material. Oper Dent 2001;26:12-6. 4. Burrow MF, Tyas MJ. Clinical evaluation of three adhesive systems for restoration of non carious cervical lesions. Oper Dent 2007;32:11-5. 5. Neo J, Chew CL. Direct tooth coloured materials for non carious lesions: A three year clinical report. Quintessence Int 1996;27:183-8. 6. Neo J, Chew CL, Yap A, Sindhu S. Clinical evaluation of tooth coloured materials in cervical lesions. Am J Dent 1996;9:15-8. 7. Bracket WW, Dib A, Bracket MG, Rayes AA, Estrada BE. Two year clinical performance of class V resin modified glassionomer and resin composite restorations. Oper Dent 2003;28:477-81. 8. Gladys S, Van Meerback, Lambrechts P, Vanberla G. Evaluation of esthetic parameters and a poly acid modified resin composite in class V cervical lesions. Quintessence Int 1999;30:607-44. 9. Flowaczy M, Loher C, Mehl A, Kunzel Mann KH, Hinkel R. Tooth coloured filling materials for the restoration of cervical lesions. 24 month follow up study. Oper Dent 2000;25:251-8. 10. Yap AU, Sim CP, Loganathan V. Color stability of a resin-modified glass ionomer cement. Oper Dent 2001;26:591-6. 11. Sunico MC, Shinkai K, Kotoh Y. Two year clinical performance of occlusal and cervical giomer restorations. Oper Dent 2005;30:282-9. 12. Matis BA, Cochran MA, Carlson TJ, Ekert GJ, Kulapongs KJ. Giomer composite and microfilled composite in clinical double blind study. J Dent Res 2002;81:77-80. 13. Gordan VV, Major IA. Short and long term evaluation of post operative sensitivityof a new resin based restorative material and self etching primer. Oper Dent 2002;27:543-8. 14. Gordan VV, Mjör IA, Vazquez O, Watson RE, Wilson N. Self etching primer and resin based restorative material: Two year clinical evaluation. J Esthet Restor Dent 2002;14:296-302. 15. Available from: http://www.shofu.com/Beautifil/2011- brochure.pdf [Last accessed on 2011 March 30]. 16. Wilson NH, Gordan VV, Brunton PA, Wilson MA, Crisp RJ, Mjör IA. Two center evaluation of a resin composite/ self etching restorative system: Three year findings. J Adhes Dent 2006;8:47-51. 17. Vleria V, Mondragon E, Watson RE, Garvan C, Mjör IA. A clinical evaluation of a self etching primer and a giomer restorative material: Results in 8 years. J Am Dent Assoc 2007;138:621-7. 18. Bracket MG, Dib A, Bracket WW, Estrada BE. Two year performance of RMGIC and resin composite restoration in unprepared class V restoration. Oper Dent 2002;27:112-6. 19. Matis BA, Cochran MJ, Carlson TJ, Guba C, Eckert GJ. Three year clinical evaluation of two dentin bonding agents. J Am Dent Assoc 2004;135:151-7. 20. Maneenut C, Tyas MJ. Clinical evaluation of resin modified restorative cements in cervical abrasion lesions: One year results. Quintessence Int 1995;26:739-43. 21. Tyas MJ. The class V lesion etiology and restoration. Am Dent J 1995;40:160-70. 22. Grippo JO. Abfractions a new classification of hard tissue lesions of teeth. J Esthet Dent 1991;3:14-9. 23. Attin T Vataschki M, Helwig E. Properties of resin modified glass ionomer restorative materials and two polyacid modified resin composite materials. Quintessence Int 1996;27:203-9. 24. Yap AU, Mok BY. Surface finish of new hybrid esthetic restorative material. Oper Dent 2002;27;161-6. 25. Cefaly DF, Seabra BG, Tapety CM, Taga EM, Valera F, Navarro MF. Effectiveness of surface protection of resin modified glass ionomer cements evaluated spectrophotometrically. Oper Dent 2001;26;401-5. 26. Mohamed Tahir MA, Yap AU. Effects of ph on the surface texture of glass ionomer based/containing restorative materials. Oper Dent 2004;29:586- 91. 27. YapAU, Yap SH, Teo CK, Ng JJ. Comparison of surface finish of new esthetic restorative materials. Oper Dent 2004;29:100-4. 28. Ikemura K, Shinno K, Fujii A, Kimoto K, Kouro Y. Two year bonding durability of self etching adhesives to enamel and dentin. J Dent Res 2002;81(Special issue A):160. Hotwani, K. and Thosar, N. and Baliga, S. and Bundale, S. and Sharma, K.
de carvalho, m.f. and botelho, a. and tavano, k. and fernandes, v.